Who was Shakespeare? A poor, unschooled glover’s son from a rural English village? Or a man of great learning and talent – and of sensitive political stature – who chose to hide his compromising poetic and political works behind the name of another, less important, less politically vulnerable man? If we are to believe conventional wisdom, we must choose the former – the village lad of no means and no instruction in the arts, letters and sciences. If we choose the latter, we must argue against what is currently written in history books – that William Shakespeare was an uneducated, only passably literate calf-skinner, who just happened to write the greatest works in the English Language – because he also happened to be a genius. In this series, Mark Anderson, author of “Shakespeare by Another Name,“ takes us through the history of the history of the Bard, and explains why biography is the only lens through which the works of Shakespeare can truly be understood. What is genius, and what is required in the training of that mind, to create history’s greatest works? Liam Scheff: How did it begin, this investigation of Shakespeare? Mark Anderson: From the mid to the late 19th Century, there was a tradition of scholars (George Greenwood being a noteworthy example), who began to re-examine the life of the traditional Shakespeare, aka William of Stratford, and found that conventional biography lacking. Throughout the 19th Century, it became a very active movement along two fronts: the anti-Stratfordians, who just knew that something was deeply wrong with the conventional story of the Stratford actor; and the Baconians, who picked one of the most famous people from the era – Francis Bacon – and said, “He must have been Shakespeare.” They had any number of reasons to say so, though they latched onto acrostics [poems with a secondary alphabetically coded meanings] that I think are pretty much indefensible. In 1888, Ignaitius Donelly wrote a book, The Great Cryptogram. In the first half, he cited all the reasons why Will Shakespeare of Stratford is not the author that history has claimed him to be. For example, he grew up in a small town, and died in that same small town, and does not seem to be recognized by anyone in that small town as somebody who was an author. His meticulous last will and testament does not indicate any kind of life of the arts or letters, (though it does mention a few actors, so he was clearly involved in the stage in some sense). Then, in 1920, J. Thomas Looney (pronounced Lone-y), picked up on the anti-Stratfordian tradition and really did the first forensic examination of the mystery. MA: His second best bed. LS: And he left his books to? MA: Nobody, he didn’t possess any books. There is not the slightest particle of anything to do with writing in the will: No books, no letters, no manuscripts, no paper, no writing desk, no pens. There is not even a hint of any kind of writer’s occupation. But you can’t excuse the lack of evidence for lack of detail. Twain also talks about how meticulously detailed the will is. “And if the man had a dog, the man probably would have bisected him and offered the second best half to his wife.” Wrote Twain. LS: So, who was this man, who possessed two beds, but no books, no paper and no pens? MA: Well, his father was a glover, He grew up in Stratford-upon-Avon. He almost certainly worked in his father’s business for some time, so he was skinning calves, honest work at that time. John Aubrey in his Brief Lives, wrote that, “When he would skin a calf he’d make a great speech!” This was the same historian who mangles facts in a series of biographies; he claims, for instance, that the poet and playwright Ben Jonson killed another playwright from the Elizabethan period, Christopher Marlowe. And on that point there’s no controversy at all: Aubrey was just completely wrong. This flowery rendition of the early life of Will of Stratford was taken as gospel truth by many Stratfordians, though not all, to be fair. It is presumed that Will went to Stratford grammar school, which is built up by defenders of the orthodoxy as a great institute of higher learning, which imparted young Will with all that he needed to write the greatest works in the English language. Not to disparage the Stratford grammar school of 1570, but you’ve actually got to get the guy there. As one Oxfordian researcher, Bonner Miller Cutting, recently pointed out, it was commonplace in wills of that time that people made bequests to the school that gave them the learning that they needed to succeed in life. But there is no such bequest in Will of Stratford’s will. And there is no evidence that he ever attended the school. Will of Stratford’s mother and father were illiterate. Of course, we don’t get to pick our parents. We do, however, get to choose how our children are brought up; and as far as we can tell, Will of Stratford’s children were also illiterate. We’re talking about the greatest writer in the English language, a man for whom letters and correspondence are a centerpiece for practically all of the plays. And he never taught his daughters to write? We all work with what we’re given, and greatness can come from all kinds of places. But raising illiterate offspring is a matter of choice, of priorities that do not bespeak a literary life. This is of a piece with all of the documents from the Stratford man’s life. The greatest literary manhunt in history has turned up nothing. LS: You say that there is no silver bullet for proving that Will of Stratford isn’t William Shakespeare, author, or for proving that Edward de Vere, 17th Earl of Oxford, is the author of Shakespeare’s plays – or is the central figure in the workshop that produced the plays. MA: There’s no silver bullet, no. But there’s a hell of a lot of of good evidence. 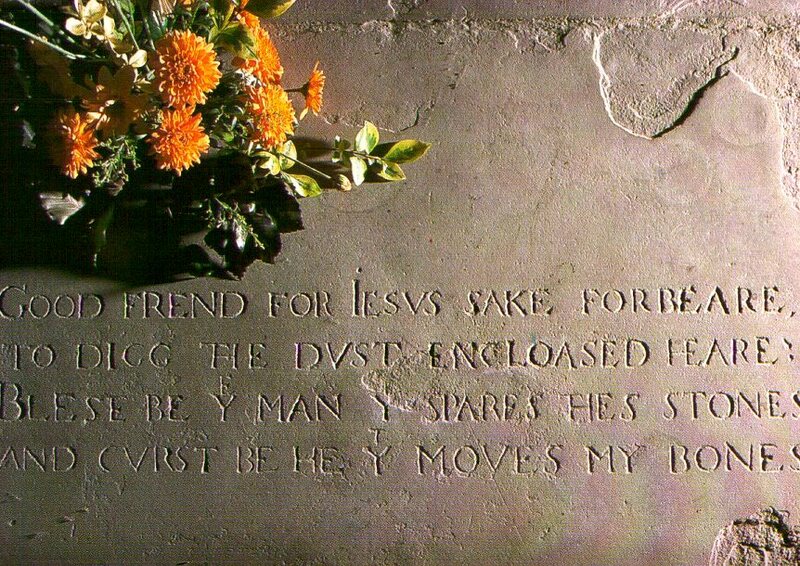 LS: Besides the will and testament, there is one piece of writing attributed directly to Will of Stratford; it is the poem – or prank – that we see at his graveside. Is this the parting shot – the closing salvo from the greatest writer in the English language? Visit the Shakespeare by Another Name Blog. Cute Cartoons Liam. Yes, I think I have heard that Shakespeare wasn’t “Shakespeare” but I never really gave it any thought because the plays are still good! Even if he didn’t write them or if somebody else wrote them. You argue that Shakespeare wasn’t educated enough to write his plays. That’s arguable, but believable, perhaps, if you have a better candidate. But we ended up with Shakespeare as the author, so that wasn’t just an accident. There has got to be a reason for that. Liam Scheff, good lively format for discussing a heavy-weight topic. Keep the dialogue coming! One of the virtues claimed by the Stratfordian world view is the picture of a common gentleman with humble background becoming/growing into a world-class genius. That is possible and appropriate historic examples of “boot strap” achievements are well documented: Mark Twain, Abraham Lincoln, etc. The lesson one therefore takes form the Stratfordian story is that education is less important than genes, that learning the classics and disciplining the mind in school are merely options. Learning styles may vary, person to person, but education (I argue) must be seen as an investment into human infrastructure that pays liberal dividends when it’s done well. And I think the biography of Edward de Vere (see SBAN) makes a strong case affirming the need for education. It is a civic imperative upon which hope itself depends. Why is it humans cannot simply abide the truth of the matter, the crux of a thing and plunge on in idiocy? Religion refuses to bow to facts and even tries to change the facts. What good does that do in the long run? The core problem most do not or cannot change is their revenue streams demand they do not…and their souls are twisted accordingly. William Shakespere was a pawn, and we remain fooled. Oxford (DeVere) was that smart. Why not? Look what he wrote and wrought.